Through a collaborative effort led by the UK College of Education, the UK College of Arts and Sciences and the UK College of Engineering, the “UK Noyce STEM PLUS: Producing Leaders for Urban/rUral Schools” project aims to attract UK students, especially students from underrepresented populations, to a unique undergraduate certification program in which they graduate with a double major in a STEM content area(s) and STEM education. The team will also work closely with Fayette County Public Schools (FCPS) to recruit graduating high school students into STEM and/or STEM education majors. 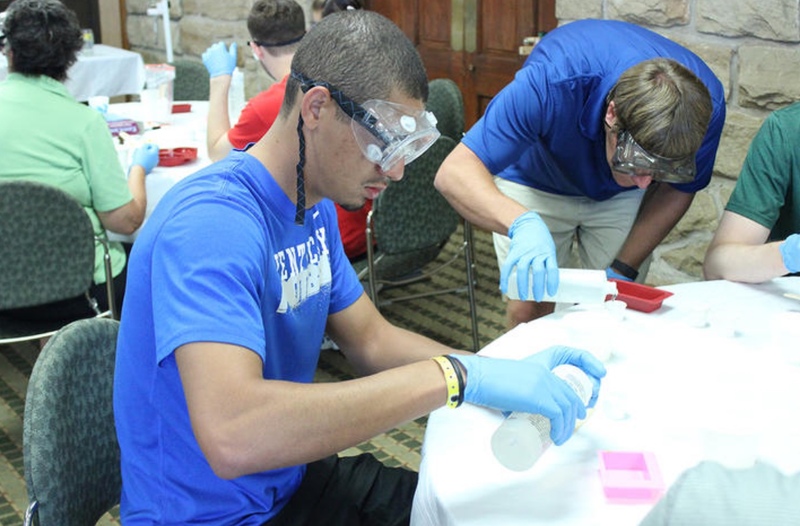 The program has been funded by the National Science Foundation (NSF) for $1.2 million over the next five years and will serve as a sustainable model for increasing student achievement in STEM areas and encouraging K-12 students to pursue STEM majors and careers. One of the major goals of the program is to provide these students with economic and cultural knowledge related to STEM development in urban and rural high needs areas, especially around energy and manufacturing challenges. In return for receiving one to two years of fellowship support, the Noyce fellows are expected to teach two to four years in a high-needs school district in Kentucky, with an emphasis in urban areas of Lexington and Louisville and rural Appalachia. Brett Criswell, co-PI and assistant professor of STEM education, says there have been concerns about STEM education and a STEM-skilled workforce in Kentucky for quite some time. Robin Cooper, associate professor of biology in the UK College of Arts and Sciences and senior personnel on the grant, says it is important to have faculty in departments across campus collaborating to create teachers with strong content knowledge. Bruce Walcott, co-PI and professor of electrical and computer engineering, says his college has been working closely with Mohr-Schroeder and the College of Education for over a decade on prior NSF Noyce awards, and they’re excited to be involved again in the STEM PLUS program. Students in the program will still have opportunities to participate in a summer institute aimed at increasing content knowledge, especially around Kentucky Academic Standards and Practices, and their implications for their classroom instruction. STEM PLUS is the newest UK project to receive Noyce funding from the NSF. UK has been providing scholarships and educating students through its Noyce program since 2007, primarily for its Master of Arts in Secondary Education with Initial Certification (MIC). Christy Williams, a teacher at George Rogers Clark High School in Winchester, Kentucky, graduated from this program in 2008 as one of the first recipients of the Noyce scholarship.